Peripheral arterial disease describes the symptoms and signs associated with impaired arterial circulation most commonly affecting the lower limbs. A reduction in walking ability may progress to severe pain in the limb even at rest or presence of a wound that may not heal due to the poor circulation. After initial assessment and subsequent investigation, you may require a balloon angioplasty, stenting or bypass procedure to improve the quality of your life or in severe cases prevent limb amputation. PAD is defined as a muscular pain brought on by walking due to a reduction in lower limb blood supply because of a narrowing or blockage of the major arteries supplying the legs. Patients may complain of crampy pain in their calves, thighs or buttocks which is termed intermittent claudication. Reduced blood supply in the legs is a common problem affecting more than 8% of patients over the age of 70 years. An estimated 200 million patients are affected globally. As described on this webpage for other vascular disease processes, poor lower limb circulation is often associated with patients as they get older. Increased rates of PAD are reported in patients with a past medical history of heart disease (angina, heart attack), cerebrovascular disease (stroke, TIA) and other cardiovascular risk factors including high blood pressure and high cholesterol. Early onset and often more severe disease presentation can be found in patients who smoke, have diabetes and impaired kidney function. Patients with a poor lifestyle who take infrequent exercise will usually present earlier with increased symptoms. There are some individuals who have lower limb circulation problems and no obvious risk factors. These individuals probably have a genetic predisposition. The process of blood vessel deterioration over time is called “atherosclerosis” . Narrowing within the arteries itself is caused by the build-up of “atheroma” which is a fatty material that develops within the lining of artery walls. All people develop small amounts of atheroma in their arteries throughout their lifetime. Some patients with the risk factors above, particularly those who smoke, form extensive atheroma and subsequent plaques more quickly. As the amount of plaque builds up over time, the artery can gradually narrow and eventually block, resulting in a significant limitation of blood supply to that limb. Some patients may develop narrowing in multiple areas of the body or at multiple points on the same artery. This process can occur in any artery in the body leading to peripheral arterial disease in the legs, angina or a heart attack if present in the heart and a stroke if present in the arteries supplying the brain. Why does peripheral arterial disease cause lower limb symptoms? All muscles require oxygen to be able to function. Lower limb blood supply delivers oxygen to these muscles which require increased amounts during periods of exertion such as walking or running. If blood supply to the lower limb is reduced because of PAD, the leg muscles do not receive adequate amounts of oxygen leading to muscle cramps and pain. This pain can increase to a level that then causes the patient to stop walking. Cessation of walking subsequently leads to a reduction in oxygen demand. Although PAD arterial narrowing causes symptoms when walking, subsequent rest means enough blood can now get to the affected leg and the leg pain gradually decreases over the next few minutes. The more severe the blood vessel narrowing, the quicker the pain can come on when walking, the shorter the patient can walk and the longer it takes for the pain to settle after resting. This is why your vascular specialist will ask how far you walk before you have to stop and rest which is called the “Claudication Distance”. How do I get an urgent vascular assessment? Patients may be referred for an urgent vascular assessment following consultation with their community general practitioner. If you attend a podiatrist on a regular basis for foot care and they notice evidence of a deterioration that concerns them, they can also refer you to the hospital podiatry department or vascular surgery team for urgent evaluation. In some cases, an infection in the foot can spread rapidly that begins to make you feel unwell despite community care. In these cases you may be referred directly to the Hospital Emergency Department. However, it is stressed that vascular specialists would prefer to have reviewed you at an earlier stage rather than wait for an infection to get out of control. What happens during my attendance at the specialist vascular clinic? At your initial clinic visit, your vascular specialist will discuss your symptoms by completing a thorough clinical history with questions about the duration of your symptoms, their severity, whether things are getting worse and how your symptoms limit your activities. Risk factors listed above on this webpage will be reviewed particularly smoking and if you have diabetes. It is important to advise your vascular specialist if you have had any clinical symptoms from blood vessel narrowing elsewhere in your body such as a previous heart attack or stroke. Your vascular specialist will then examine your abdomen and both your legs. Following an examination of all your leg pulses, a basic ultrasound test of these pulses is then performed using a hand-held doppler machine which is a type of ultrasound and is painless. Your vascular specialist will then complete a measurement of your “Ankle-Brachial Index (ABI)” which involves the placement of a blood pressure cuff around each leg at the ankle / calf level followed by evaluation of your pulses with the Doppler machine as the blood pressure cuff is inflated and then subsequently deflated. Each leg is then compared and a similar process is also completed in the arm to provide a comparison between the legs and arms. A score between 0 and 1 is calculated by dividing the leg reading by the arm reading which provides an indication of the severity of your PAD. What ankle-brachial index (ABI) readings suggest peripheral arterial disease? An ABI between 0.9 and 1.2 is regarded as normal. A reading between 0.5 and 0.9 suggests mild to moderate PAD while any reading below 0.5 suggests severe PAD and possibly critical ischaemia. Occasionally patients with conditions such as diabetes may have very high readings greater than 1.2 which can still suggest PAD as their vessels may be excessively hardened leading to a false high ABI reading. Will I need any further investigations? Your specialist will not base their diagnosis on single clinical findings. For example, some patients with relative good ABI readings have severe symptoms and some patients with ABPI less than 0.5 have completely normal walking capabilities. If your symptoms warrant further evaluation, a stepwise investigation pathway normally commences with an “arterial duplex” scan. 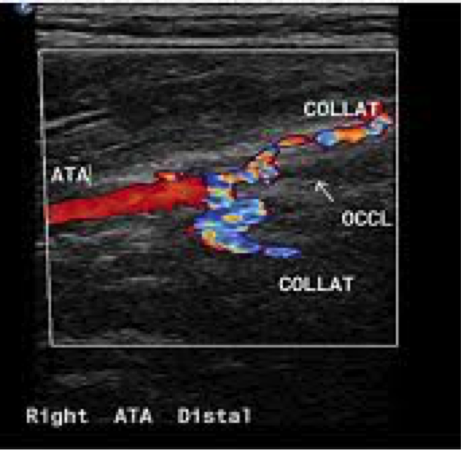 This is a non-invasive, painless accurate ultrasound investigation that provides more detailed information than the hand held Doppler machine including the location and severity of blood vessel narrowing. In some cases to further evaluate your blood vessels, your vascular specialist may organise specialised CT or MRI angiograms to assist with planning possible treatment for your blood vessels. Treatment options for peripheral arterial disease include conservative, medical, radiological and surgical modalities. What does conservative treatment mean? Conservative treatment options include generalised lifestyle improvements such as healthy eating, weight loss, an increase in exercise, minimising stress if possible and smoking cessation. Exercise hurts my legs – can it really improve my walking distance? Regular exercise improves overall cardiovascular well-being and it has been scientifically proven to increase your walking ability. Current research clearly shows that walking for 30 minutes every day continuously (not intermittently around a shopping centre) can potentially double your walking capabilities after 3 to 6 months. If you think of the narrowing of the main artery in your legs as a “Motorway” with one or two lanes closed, it is obvious that flow is going to be insufficient at peak travel times such as when you are walking rather than resting. Walking exercises do not open the motorway again – they serve to increase and improve the quality of “A, B and C” roads in your legs to help improve blood flow and reduce the strain on the motorway. This process is called “Collateralisation”. It is very easy for your vascular specialist to tell you to walk more – BUT you know it hurts !! It is important to realise that you cannot suddenly go from walking only a few minutes to 30 minutes overnight. This is a gradual process where you need to train your body and legs and it takes time. It can also be very sore at times. However, your vascular specialist will emphasise that walking through the pain will not cause you any harm – IN FACT it will serve to improve lower limb collateralisation as discussed above. Walking on a daily basis is the best exercise for your PAD. Walk until the pain develops, then rest for a few minutes. Carry on walking when the pain has eased. Keep this up for at least 30 minutes each day and if possible even extend to an hour a day and try to even walk through the pain. Regular exercise will aid weight loss which can reduce overall stress on your heart and reduce your risk of developing diabetes. What medical treatments are available for peripheral arterial disease? Medical treatments are used to improve your cardiovascular risk factor profile and reduce the progression of your peripheral arterial disease. Prior to prescription of any medication please advise your vascular specialist or general practitioner if you have had any issues or reactions to certain medications and then an alternative medication may be considered. Antiplatelet Therapy – Aspirin and Clopidogrel reduce the stickiness of platelets in your blood to limit your PAD disease progression and also reduce your risk of heart attack or stroke. Clopidogrel is used in patients who have had a history of stomach ulcers. After some clinical treatments, your vascular specialist may recommend both aspirin and clopidogrel at the same time. Cholesterol Lowering Medication – Statins are prescribed to improve your cholesterol levels in the blood where higher levels have been shown to increase the progression of your PAD. Some research has also suggested that statin therapy can aid your walking capabilities. Blood Pressure Medication – A wide range of medicines are available to treat high blood pressure. Regular blood pressure assessment and modification of medication doses over a period of many months affords optimal control rather than any sudden increase or decrease in medication. Smoking Cessation – Multiple therapies are now available to assist you including patches, oral nicotine replacement and more specialised cessation medications. Stopping smoking is the greatest preventative treatment for PAD and vascular disease elsewhere in the body. Diabetic Control – Keeping your blood sugars within reasonable limits is important to minimise your risk of PAD related complications including amputation and other cardiovascular events such as a heart attack or stroke. Other PAD medications such as cilostazol or naftidrofuryl may also be prescribed as therapies to specifically improve your walking distance. When is lifestyle advice and medical therapy recommended? Lifestyle advice and optimisation of risk factors with medical therapies are recommended for ALL patients with peripheral arterial disease. Research has demonstrated that such therapeutic measures may improve symptoms in 50% of patients while 30% of patients may experience a halt in PAD progression and remain stable. However, the other 20% of patients may still deteriorate over long-term follow-up periods. Why does my vascular specialist recommend lifestyle advice, medical therapies and not an intervention? All radiological and surgical interventions have risks. Your vascular specialist will evaluate whether such an intervention carries a net benefit compared to procedural risk. What this basically means is that if a procedure only offers a chance of minimal walking distance improvement, perhaps less than 50 yards, but a procedural amputation risk of 5% when you can already walk 400 yards – your vascular specialist will most likely opt for lifestyle advice and optimisation of medical therapy rather than place you at risk of losing your leg. The clinical decision for intervention varies between individuals. Most vascular specialists will suggest non-interventional treatments for patients who can still walk more than 200 to 400 yards. Optimisation of medical therapy can permit an improvement in your symptoms and as such your vascular specialist may review you again 4 to 6 months later to assess your progress. Some specialist units including the Northern Ireland Regional Vascular Centre at the Belfast Health and Social Care Trust have Specialist Nurse-Led Claudication Clinics for PAD patients. In the presence of limb threatening disease where blood supply is marked reduced leading to a significant risk of limb amputation, your vascular specialist may refer you urgently for additional investigations pending possible radiological or surgical intervention to improve blood supply. 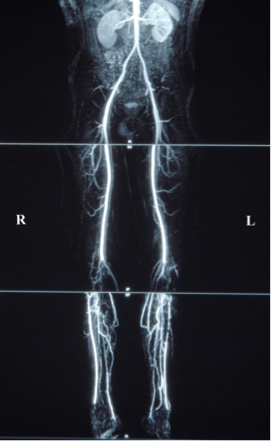 What radiological modalities can be used to treat peripheral arterial disease? Radiological modalities to improve blood supply include the use of a balloon to stretch the artery and reduce narrowing called an “angioplasty” or a cage-like scaffold device to keep a vessel open called a “stent”. What happens when I go for an angioplasty or stenting? “Angioplasty” and “Stenting” are procedures performed by a vascular specialist who may be a vascular surgeon or an interventional radiologist. An angiogram (dye test) is initially performed which assesses the location and degree of your vessel narrowing prior to consideration of angioplasty or stenting which aim to reduce the degree of blood vessel narrowing so more blood can reach the leg thereby improving symptoms. What is required before my procedure? Prior to your angiogram, your vascular specialist will try and ensure that your cardiovascular risk factors have been evaluated and optimised as much as possible. It is important to ensure that you have been prescribed antiplatelet or anticoagulation treatment and statin medications if it is safe to take these medications. It is also important that you have had a recent blood test to evaluate your kidney function. This may have already been performed by your General Practitioner or Vascular Specialist during your clinic appointment. Patients with reduced kidney function may require additional intravenous fluid on the day of their angiogram or in some circumstances may not proceed with an angiogram due to concerns about your kidneys. Diabetic patients prescribed metformin tablets should not take it on the day of the procedure and for 48 hours after the procedure. If you are on warfarin or other anticoagulation medicine, you may be asked to stop taking those tablets for 2 or 3 days before the procedure. You will be advised regarding all of these factors during your radiology pre-assessment which may be performed in person through attendance at the hospital radiology department or completed during a telephone call. Do I need to be admitted to hospital? Most angiogram procedures are performed as day cases under local anaesthetic. Occasionally, due to complexity of the procedure or due to significant patient medical co-morbidities, an overnight admission to hospital is warranted. It is important to make sure you have some family support at home following your procedure or alternative support from friends. What happens before my angiogram procedure? Most patients will have a radiology pre-assessment completed in person or via a phone call from one of the interventional radiology team members prior to their procedure for completion of procedural clinical documentation. Most patients attend fasting with no fluids or food taken from midnight on the day of their procedure. It is important that you can lie flat for the duration of the procedure which can sometimes take between 30 and 90 minutes to complete. Your vascular surgeon or interventional radiologist will visit you before the procedure and ask you to sign a consent form once they have explained the treatment to you. Please ask questions if you are unsure about any aspect of the procedure. What is the chance of success with angioplasty and stenting? Angioplasty and stenting is successful in approximately 80% to 90% of patients. Between 20% and 30% of patients experience recurrence of their symptoms in the coming years and may be considered for repeat treatment. In the small percentage where endovascular treatment does not work, the patient may be considered for a surgical bypass operation as an alternative depending on their symptoms, arterial anatomy and overall fitness for an operation. Your vascular specialist will also try and maximise the chances of your procedure lasting for a longer period of time with modern innovative strategies including the use of “drug-eluting balloons” and “drug-eluting stents”. What are the risks of angioplasty and stenting? Bleeding – an angiogram requires the insertion a needle into the artery itself followed by the careful insertion of a small tube into the artery called a sheath. For increased safety and precision, these aspects are performed using both ultrasound and x-ray guidance. Following the completion of your procedure, your vascular specialist may use a device to close the small puncture hole made by the sheath in the artery or alternatively apply pressure to the groin area for 10 to 20 minutes to help seal this hole if it is not suitable to use a closure device. During your angiogram and subsequent angioplasty / stenting procedure, you will also receive blood thinning medication to reduce the risk blood clot formation in the artery being treated and it remains very important to ensure the puncture site in the artery has sealed before your subsequent discharge. Although bleeding following your procedure is infrequent (<5%), any bleeding can have serious consequences and may warrant an emergency operation (<1%) to assess and suture the hole directly. Bruising – can occur after any endovascular intervention leading to some localised tenderness in the groin area occasionally spreading to between the legs. Please do not worry about this as most bruising settles after a few weeks. Numbness – some patients may describe numbness in the adjacent area of the groin wound. This usually settles after a few weeks. Pain – although it is natural to have some discomfort after any procedure, most patients describe minimal discomfort following their discharge from hospital. Scar – minimally invasive endovascular procedures only create a very small scar in the groin which normally fully heals. Wound Infections – your vascular specialist will pay particular attention to minimising your risk of wound infections (< 1%) following your endovascular procedure. If you notice wound redness and/or discharge or develop a temperature, it is important to report this to your vascular team if you are still in hospital or your practice nurse / general practitioner if this occurs after your discharge from hospital. Most wound infections can be treated conservatively with good nursing care, dressings and antibiotics. Early treatment is vital to minimise the risk of the infection progressing deeper. Contrast Allergy – contrast (dye) administered during your angiogram can occasionally cause an allergic reaction (<1%). Some patients may exhibit mild flushing which is often a normal response or just a mild contrast reaction whereas other patients may develop moderate to severe reactions causing headache, nausea, vomiting, itching or a skin rash. Such reactions when severe can affect your pulse and blood pressure requiring emergency treatment. Please let your vascular specialist know if you have ever had a reaction as pre-emptive medication can often limit any allergic response to contrast administration. Administration of contrast can also affect kidney (renal) function. If you are likely to be at risk of this, special precautions will be taken to reduce the chances of this problem occurring such as administration of intravenous fluids. If you are a diabetic on metformin tablets, you should not take your metformin on the day of the procedure and for 48 hours after the procedure. Distal Ischaemia – occasionally balloon treatment of a diseased narrowed artery can cause it to further narrow or even block off requiring the insertion of a stent to improve or restore blood flow again. Small fragments within the blood vessel can sometimes break off ending up further down the leg leading to some pain in the foot or toes and may even cause a foot ulcer in severe cases. This is called “Trashing” . Although this does not usually require surgery, sometimes the clot fragments can be “sucked” out during your endovascular procedure. When trashing occurs it can take many weeks or months for your symptoms to fully settle. Limb loss (amputation) following the actual endovascular procedure remains rare (<1%). However, subsequent limb loss may occur at a later stage due to the severity of the patient’s underlying arterial disease. Pseudo/False Aneurysm – when an artery is punctured during an endovascular procedure, your vascular specialist will try to ensure this puncture hole in the artery seals at the end of the procedure. Sometime the vessel does not seal at the time of the procedure or re-opens in the time-period after the procedure. This can lead to a large bruise which can continue to increase in size with flow of blood from the artery and is called a “pseudoaneurysm or false aneurysm”. Vessel Rupture – sometimes when a very diseased and narrowed blood vessel is ballooned open, the lining of the blood vessel can crack open and rupture (burst) necessitating the insertion of a special stent with a covering to seal the area. Sometimes an urgent operation is required instead (<1%). X-ray Radiation Risk – all endovascular procedures require the use of x-ray radiation. Your vascular specialist will utilise the “ALARA - As Low As Reasonably Achievable” principle to minimise the amount of x-rays used during your procedure. It remains very rare (<1%) for a patient to receive x-ray damage to their skin following a lower limb endovascular procedure. If this happens, it is normally self-resolving but will need to be monitored until full resolution has occurred. Failure to Improve Symptoms - although not strictly a complication of an endovascular procedure, a patient’s symptoms may not improve significantly despite a successful procedure. This is more frequent in patients with severe PAD and significant disease in smaller vessels below the level of the knee (popliteal artery). Patients with severe disease and those who continue to smoke are at higher risk of disease recurrence necessitating further endovascular procedures or surgery. Cardiac (Heart Attack) – although any blood vessel intervention can stress the heart, minimally invasive endovascular procedures under local anaesthetic minimise these risks as much as possible. Respiratory (Chest Infection) – avoidance of a major surgical procedure using minimally invasive endovascular techniques reduces the risk of post-procedural lung complications. It is very important to have considered smoking cessation prior to any procedure to minimise respiratory risk and enhance the chances of the balloon or stent procedure keeping the blood vessel open for longer. Thromboembolic (Clot) – all patients undergoing endovascular balloon angioplasty and/or stenting receive a heparin injection through the sheath placed within the blood vessel to minimise the risks of any clots forming in the vessel being treated. This blood vessel thinning medication will also serve to reduce the risk of subsequent thromboembolic complications where clots can form in the leg veins called a deep vein thrombosis and in the lung called a pulmonary embolus. Rapid restoration of normal mobility following your procedure will further reduce the risk of thromboembolic complications. Mortality – minimally invasive endovascular procedures under local anaesthetic have a very low mortality risk (<1%). How is angioplasty and/or stenting performed? After you arrive in the endovascular treatment room, you will be asked to lie down on the x-ray table. The endovascular team know you may be quite nervous about the procedure and will do everything possible to make you feel at ease and ensure you are as comfortable as possible. Your groin will be exposed and cleaned followed by application of a sterile drape to cover the area. Local anaesthetic is then injected with a small needle to numb the area which may sting initially for the first few seconds. Once everyone is ready and the skin is frozen, a needle then a wire followed by a tube called a “sheath” is inserted into the artery in the groin. Your vascular specialist may use an ultrasound machine combined with x-ray guidance for this initial part of your procedure to try and make sure the procedure is performed as safely as possible. This may occasionally require some pressure during its insertion and is usually the only uncomfortable part of the procedure. Occasionally it is not be possible to use the groin artery and in such cases an artery in the arm is used. During your procedure, your vascular specialist will insert a combination of endovascular wires and tubes called “catheters” through the sheath to facilitate completion of an x-ray of your blood vessels called an “angiogram”. Angiograms are performed using x-ray dye (contrast) which has been administered into the artery via the previously inserted sheath or catheter. A series of x–ray angiograms are then taken to confirm the position and extent of your arterial narrowing or blockage. The contrast may give you a warm feeling each time it is administered and may make you feel the need to pass water. Please do not worry as this is entirely normal. Once the area of narrowing or blockage has been identified, your vascular specialist will then try to treat these areas with balloon angioplasty, stenting or a combination of both modalities. Blood thinning medicine called heparin is then administered. A fine guide wire is inserted through the previously inserted sheath using a catheter to aid its passage through the diseased blood vessel. 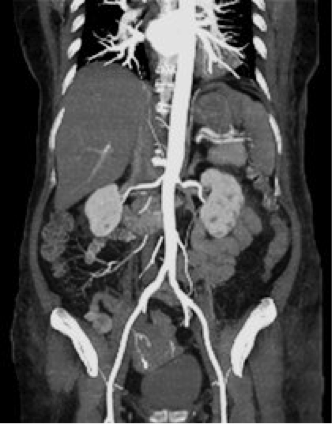 Intermittent x–ray angiograms are used to guide its passage along the artery and through the narrowing or blockage. A small tube with a balloon on the end is then fed over the guide wire until the balloon is either side of the narrowing. Once the balloon is in the correct position, it is subsequently inflated to stretch the artery open. If the balloon angioplasty is successful, the balloon is subsequently deflated and removed. Further x–ray angiograms are then performed to see how the vessel has responded to the treatment and to ensure the artery remains open. The angioplasty may need to be repeated with the same balloon or sometimes a slightly larger balloon may be required. If the blood flow in the artery to the legs is still not adequately improved, your vascular specialist may then insert a metal tube scaffold called a “stent” which is then accurately released (deployed) in the narrowed area of the artery. When the stent has been released, it cannot be removed and will become covered by the lining of the artery in time. At the end of the procedure, the sheath is removed from the groin or elbow. A doctor or nurse will then press firmly over the site for 10 to 15 minutes to help seal the puncture hole in the artery. In some cases, the vascular specialist will use a device to seal the puncture hole in the artery. Both of these techniques try to prevent and minimise the risk of bleeding from this area. A small dressing is then applied over the puncture wound. What happens after angioplasty and/or stenting? Once your vascular specialist is content that the puncture site in your groin or elbow has settled, you will be transferred to the interventional radiology recovery area. You will be asked to lie flat without moving too much for between 1 to 2 hours depending on the actual procedure performed. You will be required to stay in bed for a further period of time which is usually between 2 to 4 hours. However, your will be allowed to sit up and will be able to eat and drink. After this period of bed rest, your groin or elbow area will be checked prior to allowing you to get up out of bed and walk. Do I need to alter my medication following my angiogram? Your vascular specialist will stress the importance of your medication which is essential to try and keep your blood vessel open and working for as long as possible after your procedure. This medication may include aspirin (75mg once a day), clopidogrel (75mg once a day) or anticoagulation tablets such as warfarin which thin the blood and help prevent any clots forming which can quickly block an artery or stent. Sometimes you may need to take a combination of tablets for a period of 3 to 12 months before returning to just aspirin or clopidogrel. When you get home, you should check your wound regularly. You may have some bruising which can sometimes spread to the area between your legs. This is quite common so please don’t worry. However, if a swelling develops in the area or if the area becomes hard to the touch or painful you should contact your doctor. If your wound starts to bleed, you should press firmly on it and contact the hospital immediately or call for an ambulance. If it is safe for you to do so, you should drink plenty of water for 2 days after the procedure to flush the contrast dye out of your kidneys. Although you can shower 24 hours after treatment, you should avoid baths for the first 3 days. You shouldn't lift anything heavy or drive for the first week after your angioplasty. Most patients can return to work after a week. Am I reviewed after my angiogram procedure? The vascular specialist performing your angiogram may not be the same clinician you saw in the clinic. After your angiogram, a report of the procedure will be sent to this clinician to ensure a review out-patient clinic appointment is made approximately 6 to 12 weeks following your procedure to discuss your treatment and assess your recovery. What happens if my vessels could not be treated by endovascular angioplasty or stenting or if the procedure has not been successful? This will all depend on your current symptoms and varies widely for each patient. Your vascular specialist will speak to you after your angiogram. In patients who can still manage to walk a few hundred yards, your vascular specialist will most likely suggest for you to continue on your medical treatment and walk as much as possible. Although this may be quite a challenge, it avoids the need for an operation where the risks may outweigh the possible benefits for you. In patients, with severe limitations to their walking or those who are at risk of losing their limb without an intervention, your vascular specialist will discuss the need to consider an operation to improve the blood supply to your limbs. Although all operations have a risk, it may be deemed appropriate in patients as a limb-saving procedure. Sometimes an operation may not be appropriate if you have multiple or significant medical problems which would mean you would not be able to tolerate or survive such an intervention. Some patients may also have such severe disease in their blood vessels that a bypass operation is not possible. What options are available to me when my consultant discusses operative intervention? Your vascular surgeon will complete a thorough assessment of your current symptoms, examine your lower limbs and review all your previous blood vessel investigations. At this stage, they will discuss possible operative options to improve blood flow to your limb which normally includes an endarterectomy, bypass procedure or a combination of these options. Sometimes an angiogram followed by angioplasty or stenting can be completed as well during your operation. What is an endarterectomy and patch angioplasty? An endarterectomy is a procedure to improve lower limb blood supply performed by coring out the narrowed or blocked area in the actual blood vessel followed by placement of a patch over the top of the opening in the blood vessel to make it wider. This allows more blood to get through to the affected limb. An endarterectomy is usually suggested if the narrowed or blocked area is not very long in length. An arterial bypass is a procedure to improve lower limb blood supply performed by connecting a substitute vessel or tube from an area above a blockage to an area below the blockage. An arterial bypass is usually suggested if the narrowed or blocked area is longer in length. What is required before my lower limb revascularisation procedure (endarterectomy or bypass)? Prior to your lower limb revascularisation procedure, your vascular surgeon will try and ensure that your cardiovascular risk factors have been evaluated and optimised as much as possible. It is important to ensure that you have been prescribed antiplatelet or anticoagulation treatment and statin medications if it is safe to take these medications. Smoking cessation is exceptionally important to try and optimise your short- and long-term outcomes following your lower limb revascularisation procedure. Do I need any fitness tests prior to surgery? You will require an anaesthetic pre-assessment a few weeks before your surgery which includes a clinical evaluation, blood work-up and some additional investigations for your heart ( Electrocardiogram-ECG and Echocardiogram-ECHO ) and your lungs (Chest X-ray and Pulmonary Function Tests-PFTS ). It is important to inform your specialist of all your medical conditions and current medications which may be amended to optimise your recovery particularly those medications prescribed for the treatment of diabetes, heart or lung disease. When do I need to be admitted to hospital? Most anaesthetic assessments and subsequent heart and lung tests can be performed during out-patient attendances prior to your planned surgery date. At the Royal Victoria Hospital, patients are usually admitted the day before surgery. Patients undergoing lower limb revascularisation procedures are usually admitted the day before surgery. Your vascular surgeon will visit you before the procedure and ask you to sign a consent form once they have explained the treatment to you. Please ask questions if you are unsure about any aspect of the procedure. Due to the complex nature of some lower limb revascularisation procedures, patients may require a High Dependency or Intensive Care Unit bed following your surgery. Occasionally these specialised beds may not be available on the day of your surgery leading to subsequent postponement of your surgery to a different day on the same admission or occasionally discharge from hospital and re-booking of surgery on a different admission date. Your vascular surgeon will advise you accordingly and will wish to apologise for such an event if it happens. Do I have to fast before my surgery? You will be advised regarding fasting periods before surgery which is usually at least 6 hours before a general anaesthetic. Most patients will be fasted from midnight on the day of their lower limb revascularisation procedures. As many other aspects can vary depending on your procedure, patients will have an individualised care plan. What is the success rate following an operation to improve my lower limb blood supply? Success rates of surgery to treat peripheral arterial disease depend on the location and severity of your disease and the type of replacement tube (vein or plastic) used to create the bypass graft. An 80% to 90% success rate over 5-years can be achieved if the bypass is created in the lower abdomen or upper legs compared to approximately 50% to 70% if the bypass has to extend to a smaller vessel below the knee. A bypass graft has a better chance of longer term success if you are a non-smoker or have stopped smoking, continue to take all your medications correctly and if the surgeon is able to construct the bypass graft using your own vein obtained from elsewhere in your body rather than an artificial (prosthetic) graft. What are the risks of arterial bypass surgery? Bleeding – lower extremity revascularisation operations often require a long wound down the affected lower limb to gain access to the healthier blood vessels above and below the narrowed or blocked area and to harvest your own vein if possible for the bypass graft itself. Blood thinning medication is also administered during the procedure to reduce the risk blood clot formation in the artery being treated. Your vascular surgeon will check all aspects of the wound and bypass graft at the completion of the procedure to ensure there is no evidence of bleeding prior to suturing your lower limb wounds. Although bleeding following your procedure is infrequent (<5%), any bleeding can have serious consequences and may warrant an emergency operation (<1%) to assess and treat accordingly. Bruising – can occur after any vascular operation leading to some localised tenderness in the groin and lower limb areas occasionally spreading to between the legs. Please do not worry about this as most bruising settles after a few weeks. Numbness – some patients may describe numbness in the adjacent area of the groin wound which can extend down towards the inside of the knee. This usually settles after a few weeks or months. Pain – although it is natural to have some discomfort after any procedure, your vascular and anaesthetic team will ensure your pain medication is optimised as this will significantly improve your recovery and ability to mobilise following your surgery. Scar – an endarterectomy may only require a small wound in the groin. Arterial bypass wounds are often a lot longer depending on the location and severity of your narrowed or blocked artery. Although all scars will normally fully heal, sometimes there can be some weeping from the wound as your leg may swell following your surgery. Post-operative wound dressings may also be required to protect the wound for the first few days or weeks after your surgery. Wound Infections – your vascular specialist will pay particular attention to minimising your risk of wound infections (< 1%) following your operative procedure. If you notice wound redness and/or discharge or develop a temperature, it is important to report this to your vascular team if you are still in hospital or your practice nurse / general practitioner if this occurs after your discharge from hospital. Most wound infections can be treated conservatively with good nursing care, dressings and antibiotics. Early treatment is vital to minimise the risk of the infection progressing deeper especially if you have had a prosthetic patch or bypass graft placed during your surgery. Distal Ischaemia – sometimes your blood vessel can be so significantly diseased that despite your vascular surgeon’s best efforts, the lower limb blood supply does not improve as much as desired or may have a limited beneficial effect. This may limit the expected improvements on your walking. More importantly it may still mean that you are at risk of limb loss – amputation . Occasionally operative treatment of a diseased narrowed artery can cause small fragments within the blood vessel to sometimes break off ending up further down the leg leading to some pain in the foot or toes and may even cause a foot ulcer in severe cases. This is called “Trashing” . When trashing occurs it can take many weeks or months for your symptoms to fully settle. Graft Occlusion (Blockage) – bypass operations do not last forever. During your procedure, your vascular surgeon will endeavour to complete your surgery to a very high standard to improve your clinical outcome. This may involve optimising the blood supply at the top of the bypass with completion of an endarterectomy or balloon angioplasty if required. In addition, you will have further scans to see if you have a vein that may be used for your bypass – this usually comes from the same leg that is being treated but can be obtained from the opposite leg or even your arms. Compared to a vein bypass graft, a prosthetic graft has a lower lifespan which can be optimised with smoking cessation and best medical therapy. Approximately 10% of patients may suffer a graft occlusion in the first 6 weeks following their surgery. These patients may require an additional endovascular or operative procedure to restore flow and normal graft function. A graft occlusion may occur after a foot ulcer has healed and in the absence of new symptoms, your procedure would still be considered a success. Not all patients with a graft occlusion require additional surgery which can be often significantly more complex that the initial primary surgery. Graft Infection – this is a serious problem (<1%) with prosthetic (artificial) grafts often requiring prolonged antibiotic treatment and occasionally further surgery to remove the graft. Limb Ischaemia / Loss – even in severe cases, your vascular surgeon will still try their best to improve the blood supply to your affected limb. Your vascular surgeon will usually not wish to consider limb loss (amputation) at the same time as your revascularisation procedure as it preferred to wait and see how you respond to the endarterectomy or bypass procedure. Subsequent limb loss may however occur at a later stage on the same admission or in the future in the presence of very severe arterial narrowing or blockages. Limb Swelling – any operative procedure in the lower limb can cause an element of swelling as you recover from your surgery. Following a lower limb revascularisation procedure, patients may have additional swelling as their leg tries to get used to the increased blood flow – essentially moving from “Famine to Feast”. Fluid can sometimes leak out through the wound during this time. Please try not to worry as careful wound care in hospital and in the community normally settles this down. As your mobility improves during your recovery, the swelling tends to reduce. Intermittent elevation often helps as well. However, it can take many weeks or even months for the swelling to settle. The revascularised lower limb may always be slightly bigger than the other side. Compression stockings are usually not suggested unless specifically advised by your vascular surgeon. Nerve Injury / Numbness – sometimes the femoral nerve in the groin can get stretched or bruised during the surgery leading to numbness in the groin extending down the inside of the thigh towards the knee. The saphenous nerve lies very close to the great saphenous vein which is often the vein of choice for vascular surgeons to use as the arterial bypass tube. Bruising of this nerve can lead to an area of numbness on the inside of the knee. This may occur in approximately 5% to 10% of patients. However, most of these affected patients (90% to 95%) will have resolution of the numbness 6 to 12 months following their procedure. Seroma – Any incision in the groin area can sometimes disrupt some vessel channels called lymphatics. Such disruption can lead to the collection of sterile fluid below the skin leading to the impression of a small soft “golf-ball” appearance in the groin. This is usually a benign process and resolves spontaneously. However, full resolution can take many months. If the swelling starts to affect the skin or cause pain due to pressure, the seroma may require sterile aspiration drainage using a needle and syringe. Very rarely is re-exploration of the groin wound required. Failure to Improve Symptoms - although not strictly a complication of an arterial revascularisation procedure, a patient’s symptoms may not improve significantly despite a successful procedure. This is more frequent in patients with severe PAD and significant disease in smaller vessels below the level of the knee (popliteal artery). Patients with severe disease and those who continue to smoke are at higher risk of disease recurrence and amputation necessitating further endovascular procedures or surgery. Cardiac (Heart Attack) – any blood vessel intervention can stress the heart. Your vascular surgeon will try and arrange an anaesthetic assessment prior to your surgery to try and optimise your medical co-morbidities to minimise cardiac risk during your lower limb arterial procedure as much as possible. Respiratory (Chest Infection) – although lower extremity revascularisation procedures often avoid an abdominal incision, such procedures can still take many hours to perform which can affect your breathing during your recovery. It is very important to have considered smoking cessation prior to any procedure to minimise respiratory risk and enhance the chances of the procedure keeping the blood vessel open for longer. Thromboembolic (Clot) – all patients undergoing any lower limb revascularisation surgery receive a heparin injection during the procedure to minimise the risks of any clots forming in the vessel being treated. This blood vessel thinning medication will also serve to reduce the risk of subsequent thromboembolic complications where clots can form in the leg veins called a deep vein thrombosis and in the lung called a pulmonary embolus. Rapid restoration of normal mobility following your procedure will further reduce the risk of thromboembolic complications. Mortality – planned (elective) lower limb arterial procedures have a low mortality risk (<1%). How is a femoral endarterectomy performed? After you are positioned appropriately on the operating table, the affected lower limb skin area is shaved (if required), cleaned with aseptic fluid and surgical drapes are then applied to maintain a sterile operative field for the operation. A vertical groin incision is performed to expose the femoral artery and the arteries it divides into called the superficial femoral and profunda femoris arteries. Blood thinning medication called heparin is then administered via one of your veins by the anaesthetist. Clamps are applied above and below the area of narrowing or blockage that has caused your symptoms. The artery is then opened and subsequently cleaned out to remove the diseased area. Once your vascular surgeon is content the roughened and narrowed diseased segment has been addressed an “artificial” patch is then sutured in place to repair the artery, maintain good flow and minimise risk of future narrowing. Once the patch has been sutured in place, the clamps are subsequently removed from the artery to make sure there are no leaks from the patch. When your surgeon is satisfied that normal blood flow in the artery has been restored, the wound is then closed carefully with layers of sutures. The skin sutures are designed to dissolve by themselves and do not require removal. Sometimes your surgeon will use skin clips instead to close the wound which then require removal between 10 and 14 days following your surgery. Occasionally, a small drainage tube is inserted in the groin to drain off any accumulating fluid or blood following the surgery. The operation is now complete and you will be taken to the recovery area. The operation usually takes between 1 to 2 hours. How is an arterial bypass performed? The type of arterial bypass operation performed will depend on the location of the narrowing or blockage and the planned position of the bypass graft above and below the diseased vessel. The substitute tube (bypass graft) is usually your own vein from the same limb, your own vein from a different limb or a plastic artificial tube. The bypass graft is connected to healthy artery above and below the blockage so that increased amounts of blood reach the previously starved tissues. These operations tend to be performed on patients who have more severe PAD with associated rest pain, infection and tissue loss or in patients with an arterial narrowing or blockage which cannot be treated with endovascular angioplasty or stenting techniques. After you are positioned appropriately on the operating table, the affected lower limb skin area is shaved (if required), cleaned with aseptic fluid and surgical drapes are then applied to maintain a sterile operative field for the operation. A vertical groin incision is performed to expose the femoral artery and the arteries it divides into called the superficial femoral and profunda femoris arteries. A further incision is completed lower down the affected limb, usually on the inside of the knee, to expose the healthy artery below the narrowing or blockage. At this time, the vascular surgeon will complete a further long incision which usually connects the two wounds to dissect out your own vein for use as the bypass graft. The surgeon will then create a tunnel in a deeper layer in your leg for positioning of the bypass graft to protect it. Blood thinning medication called heparin is then administered via one of your veins by the anaesthetist. Clamps are applied to the arteries above and below the area of narrowing or blockage that has caused your symptoms. Both arteries are then opened and subsequently cleaned out to remove any evidence of disease if required. Once your vascular surgeon is content the two vessels above and below the diseased segment are satisfactory, they will then suture the bypass graft separately to these two areas therefore bypassing the narrowed or blocked arterial segment. Once the bypass graft has been sutured in place, the clamps are subsequently removed from the artery to make sure there are no leaks from the patch. When your surgeon is satisfied that normal blood flow in the artery has been restored, the wounds are then closed carefully with layers of sutures. The skin sutures are designed to dissolve by themselves and do not require removal. Sometimes your surgeon will use skin clips instead to close the wound which then require removal between 10 and 14 days following your surgery. Occasionally, a small drainage tube is inserted in the groin or calf to drain off any accumulating fluid or blood following the surgery. The operation is now complete and you will be taken to the recovery area. The operation usually takes between 2 to 5 hours. Informed patient consent for lower limb arterial surgery? Although your surgeon will have discussed initial aspects of your lower limb revascularisation procedure during your initial out-patient clinic attendance, they will also meet you before the operation and go through all the required information regarding your planned intervention. The surgeon will then ask you to sign a consent form for your lower limb revascularisation procedure after they have explained the procedure to you. You will have all aspects of surgery discussed with you ensuring you are aware of why the surgery is required and what risks and complications are associated with the surgery. Will I meet my anaesthetist before my surgery? You will have an opportunity to meet your anaesthetist before your surgery who will advise accordingly what type of anaesthesia will be required. For lower limb revascularisation procedures, general, spinal or local anaesthesia can be used. What happens when I arrive in the Operating Theatre? Patients are normally taken to the operating department in their own vascular ward beds. All staff members will introduce themselves to you as we know you will be very nervous pending your procedure. After you are checked into the theatre environment you will meet your anaesthetic team. Once your anaesthesia is complete, various tubes will be inserted into your bladder, wrist artery and arm veins. This will allow you to be accurately monitored and can facilitate administration of medications, fluid or blood products during your procedure. Not necessarily. Occasionally you may still require additional blood products from donors during your lower limb revascularisation procedure or in the post-operative period. Please make your vascular specialist aware as early as possible if you have personal or religious concerns regarding the administration of donor blood products. Will I feel pain following the surgery? Prior to your surgery, the anaesthetic team will have discussed post-operative pain relief which can be provided using oral pain relief tablets or a patient-controlled anaesthesia where you, the patient, press a button to provides pain relief at given intervals. Most patients will experience some discomfort after any major procedure. However, your specialist vascular team will do their best to try and minimise any pain you may have during your post-operative recovery. It is well researched that optimisation of your pain relief after your procedure affords you a better outcome which is exactly what your vascular team wish for you. What happens following my surgery? All patients are transferred to the Operating Theatre recovery area immediately following surgery for a period of time to ensure you have stabilised after your procedure. Following this period which is usually at least a few hours, you may be transferred back to the vascular ward if you have minimal medical problems and were relatively fit and healthy prior to your procedure. The nurses and doctors will try and keep you free of pain by administering oral pain relief tablets, pain killers by injection or using a machine that you are able to control yourself by pressing a button called patient controlled analgesia (PCA). You will also be given a daily injection of heparin under the skin to reduce the risk of clotting in your veins (known as “deep vein thrombosis”). During your anaesthetic assessment, you vascular team may have decided that a high dependency or intensive care bed is required for your initial post-operative recovery period. When you are deemed stable and require no additional breathing or heart support, you will be transferred back to the vascular ward. Unfortunately, when a high dependency or intensive care bed is unavailable in the hospital, your surgery may be postponed or re-scheduled. As you recover from surgery, your normal diet and medications will be restarted. The physiotherapists may visit you after your operation to help with your breathing to prevent you developing a chest infection and with your mobilisation to get you walking again. You will be encouraged to mobilise which should gradually be increased until you are fit enough to go home. How long do I stay in hospital after lower limb arterial surgery? Following your admission the day before your lower limb revascularisation procedure, most patients are discharged home after 2 or 3 days following a femoral endarterectomy or after 2 to 5 days following a lower limb arterial bypass. Do I need any stitches removed? Most skin wounds can be closed with an invisible suture layer (subcuticular) and you will only require a dressing over the wound for the first few days. If your surgeon uses external sutures or skin staples (clips), these remain for between 10 and 14 days after your procedure. Some patients will have sutures removed in hospital if they are still an in-patient while the majority will have removal arranged by their district nurse following their discharge who will also complete a wound check. What is my projected post-operative recovery period like following hospital discharge? You may feel tired for a few weeks or months after the operation but this should gradually improve over time. Regular exercise such as a short walk combined with rest is recommended for the first few weeks following surgery followed by a gradual return to your normal activity. Most patients comment that they return to normal approximately 3 to 4 months after a lower limb revascularisation procedure. Patients are often very pleased that their severe lower limb pain present before surgery has now settled somewhat or even completely disappeared. What activities can I do following discharge from hospital? You should be shower lightly whilst your wounds are healing. It is not advised to fully immerse non-healed wounds in a bath until they are fully healed. You should avoid heavy lifting for at least 6 weeks after the operation to protect the wound. You should refrain from driving for at least for 2 to 4 weeks after lower limb revascularisation surgery provided you can competently perform an emergency stop under controlled conditions. It is suggested to advise your car insurance of your recent lower limb revascularisation surgery. Most people undergoing lower limb revascularisation surgery are retired. If you are still working, you will need a minimum of at least 4 to 6 weeks recuperation or sometimes slightly longer depending on your occupational duties. What hospital clinic follow-up will be arranged after my hospital discharge? Your consultant will organise a follow–up appointment with you 6 to 12 weeks following your procedure to discuss your treatment and assess your recovery. Occasionally this post-operative review will be earlier at 1 to 2 weeks if you have a pre-existing or operative wound that requires surveillance. Do I need any scans after my lower limb arterial surgery? Following your lower limb revascularisation procedure, some vascular specialists may organise a post-operative ultrasound duplex scan. Other vascular specialists prefer to monitor your progress clinically and if continued improvement is identified, a scan may not be warranted and only requested in the presence of a deterioration or wound concern.